"Corinthians" redirects here. For other uses, see Corinthian (disambiguation). 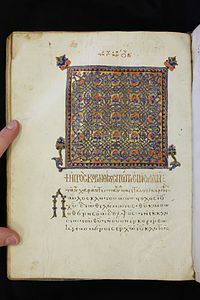 The First Epistle to the Corinthians (Ancient Greek: Α΄ ᾽Επιστολὴ πρὸς Κορινθίους), usually referred to simply as First Corinthians and often written 1 Corinthians, is one of the Pauline epistles of the New Testament of the Christian Bible. The epistle says that Paul the Apostle and "Sosthenes our brother" wrote it to "the church of God which is at Corinth" 1 Cor.1:1–2 although the scholarly consensus holds that Sosthenes was the amanuensis who wrote down the text of the letter at Paul's direction. Called "a masterpiece of pastoral theology", it addresses various issues that had arisen in the Christian community at Corinth. This epistle contains some well-known phrases, including: "all things to all men" (9:22), "through a glass, darkly" (13:12), and "When I was a child, I spoke as a child, I understood as a child, I thought as a child" (13:11). There is consensus among historians and Christian theologians that Paul is the author of the First Epistle to the Corinthians (c. AD 53–54). The letter is quoted or mentioned by the earliest of sources, and is included in every ancient canon, including that of Marcion. The personal and even embarrassing texts about immorality in the church increase consensus. However, a passage may have been inserted at a later stage. This passage is 1 Corinthians 14:34–35, the authenticity of which has been hotly debated. Part of the reason for doubt is that in some manuscripts, the verses come at the end of the chapter instead of at its present location. Furthermore, Paul is here appealing to the law which is uncharacteristic of him. Lastly, the verses come into conflict with 11:5 where women are described as praying and prophesying. As well, 10:1–22 is sometimes regarded as another letter fragment, interpolation, or inserted midrash because, among other things, this section virtually seems to equate the consumption of idol meat with idolatry, but Paul seems more lenient regarding its consumption in 8:1–13 and 10:23–11:1. Such views are rejected by other scholars who give arguments for the unity of 8:1–11:1. About the year AD 50, towards the end of his second missionary journey, Paul founded the church in Corinth, before moving on to Ephesus, a city on the west coast of today's Turkey, about 180 miles by sea from Corinth. From there he traveled to Caesarea, and Antioch. Paul returned to Ephesus on his third missionary journey and spent approximately three years there (Acts 19:8, 19:10, 20:31). It was while staying in Ephesus that he received disconcerting news of the community in Corinth regarding jealousies, rivalry, and immoral behavior. It also appears that based on a letter the Corinthians sent Paul (e.g. 7:1), the congregation was requesting clarification on a number of matters, such as marriage and the consumption of meat previously offered to idols. By comparing Acts of the Apostles 18:1–17 and mentions of Ephesus in the Corinthian correspondence, scholars suggest that the letter was written during Paul's stay in Ephesus, which is usually dated as being in the range of AD 53–57. Anthony C. Thiselton suggests that it is possible that I Corinthians was written during Paul's first (brief) stay in Ephesus, at the end of his Second Journey, usually dated to early AD 54. However, it is more likely that it was written during his extended stay in Ephesus, where he refers to sending Timothy to them (Acts 19:22, I Cor. 4:17). Paul addresses the issue regarding challenges to his apostleship and defends the issue by claiming that it was given to him through a revelation from Christ. The salutation (the first section of the letter) reinforces the legitimacy of Paul's apostolic claim. The thanksgiving part of the letter is typical of Hellenistic letter writing. In a thanksgiving recitation the writer thanks God for health, a safe journey, deliverance from danger, or good fortune. Now concerning the contribution for the saints: as I directed the churches of Galatia… Let all your things be done with charity. Greet one another with a holy kiss... I, Paul, write this greeting with my own hand. If any man love not the Lord Jesus Christ, let him be Anathema Maranatha. The grace of the Lord Jesus be with you. My love be with you all in Christ Jesus. Amen. Some time before 2 Corinthians was written, Paul paid them a second visit (2 Cor. 12: 14; 2 Cor. 13: 1) to check some rising disorder (2 Cor. 2: 1; 2 Cor. 13: 2), and wrote them a letter, now lost (1 Cor. 5: 9). They had also been visited by Apollos (Acts 18: 27), perhaps by Peter (1 Cor. 1: 12), and by some Jewish Christians who brought with them letters of commendation from Jerusalem (1 Cor. 1: 12; 2 Cor. 3: 1; 2 Cor. 5: 16; 2 Cor. 11: 23). Paul wrote this letter to correct what he saw as erroneous views in the Corinthian church. Several sources informed Paul of conflicts within the church at Corinth: Apollos (Acts 19:1), a letter from the Corinthians, the "household of Chloe", and finally Stephanas and his two friends who had visited Paul (1:11; 16:17). Paul then wrote this letter to the Corinthians, urging uniformity of belief ("that ye all speak the same thing and that there be no divisions among you", 1:10) and expounding Christian doctrine. Titus and a brother whose name is not given were probably the bearers of the letter to the church at Corinth (2 Corinthians 2:13; 8:6, 16–18). In general, divisions within the church at Corinth seem to be a problem, and Paul makes it a point to mention these conflicts in the beginning. Specifically, pagan roots still hold sway within their community. Paul wants to bring them back to what he sees as correct doctrine, stating that God has given him the opportunity to be a "skilled master builder" to lay the foundation and let others build upon it (1 Cor 3:10). Later, Paul wrote about immorality in Corinth by discussing an immoral brother, how to resolve personal disputes, and sexual purity. Regarding marriage, Paul states that it is better for Christians to remain unmarried, but that if they lacked self-control, it is better to marry than "burn" (πυροῦσθαι) which Christians have traditionally thought meant to burn with sinful desires. The Epistle may include marriage as an apostolic practice in 1 Corinthians 9:5, "Do we not have the right to be accompanied by a believing wife, as do the other apostles and the brothers of the Lord and Cephas (Peter)?" (In the last case, the letter concurs with Matthew 8:14, which mentions Peter having a mother-in-law and thus, by interpolation, a wife.) However, the Greek word for "wife" is the same word for "woman". 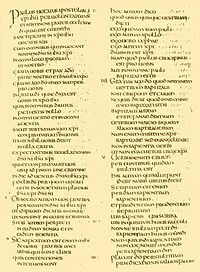 The Early Church Fathers including Tertullian, Jerome, and Augustine state the Greek word is ambiguous and the women in 1 Corinthians 9:5 were women ministering to the Apostles as women ministered to Christ (cf Matthew 27:55, Luke 8:1–3), and were not wives, and assert they left their "offices of marriage" to follow Christ. Paul also argues that married people must please their spouses, just as every Christian must please God. The letter is also notable for mentioning the role of women in churches, that for instance they must remain silent (1 Cor. 14:34–35), and yet they have a role of prophecy and apparently speaking tongues in churches (11:2–16). If 14:34–35 is not an interpolation, certain scholars resolve the tension between these texts by positing that wives were either contesting their husband's inspired speeches at church, or the wives/women were chatting and asking questions in a disorderly manner when others were giving inspired utterances. Their silence was unique to the particular situation in the Corinthian gatherings at that time, and on this reading, Paul did not intend his words to be universalized for all women of all churches of all eras. After discussing his views on worshipping idols, Paul finally ends with his views on resurrection. He states that Christ died for our sins, and was buried, and rose on the third day according to the scriptures (1 Cor. 15:3). Paul then asks: "Now if Christ is preached as raised from the dead, how can some of you say that there is no resurrection of the dead?" (1 Cor. 15:12) and addresses the question of resurrection. Throughout the letter, Paul presents issues that are troubling the community in Corinth and offers ways to fix them. Paul states that this letter is to "admonish" them as beloved children. They are expected to become imitators of Jesus and follow the ways in Christ as he, Paul, teaches in all his churches (1 Cor. 4:14–16). St. John Chrysostom, Doctor of the Church, wrote a commentary on 1 Corinthians, formed by 44 homilies. ^ "Uncials – Ancient Biblical Manuscripts Online – LibGuides at Baptist Missionary Association Theological Seminary". ^ Gench, Frances Taylor (2015-05-18). Encountering God in Tyrannical Texts: Reflections on Paul, Women, and the Authority of Scripture. Presbyterian Publishing Corp. p. 97. ISBN 9780664259525. ^ John Muddiman, John Barton, ed. (2001). The Oxford Bible Commentary. New York: Oxford University Press Inc. p. 1130. ISBN 978-0-19-875500-5. ^ Walter Schmithals, Gnosticism in Corinth (Nashville: Abingdon, 1971), 14, 92–95; Lamar Cope, "First Corinthians 8–10: Continuity or Contradiction?" Anglican Theological Review: Supplementary Series II. Christ and His Communities (Mar. 1990) 114–23. ^ Joop F. M. Smit, About the Idol Offerings (Leuven: Peeters, 2000); B. J. Oropeza, "Laying to Rest the Midrash," Biblica 79 (1998) 57–68. ^ Anthony C. Thiselton, The First Epistle to the Corinthians (Eerdmans, 2000), 31. ^ Tertullian, On Monogamy "For have we not the power of eating and drinking?" he does not demonstrate that "wives" were led about by the apostles, whom even such as have not still have the power of eating and drinking; but simply "women", who used to minister to them in the stone way (as they did) when accompanying the Lord." ^ Jerome, Against Jovinianus, Book I "In accordance with this rule Peter and the other Apostles (I must give Jovinianus something now and then out of my abundance) had indeed wives, but those which they had taken before they knew the Gospel. But once they were received into the Apostolate, they forsook the offices of marriage." ^ "John Chrysostom's homilies on 1 Corinthians" (in English and Latin). Archived from the original on Apr 12, 2019. "Corinthians, Epistles to the" . The American Cyclopædia. 1879. "Corinthians, First Epistle to the" . Easton's Bible Dictionary. 1897.